Have you ever cut a cake across horizontally? Alton Brown spent an entire ten minute segment on Good Eats on this very thing. I ended up using floss, which worked somewhat well if not jaggedly. Oh, whaddya know? All FOUR cake layers and SIX icing layers are assembled and popped into the fridge to set up! One last step, to ice it. Ina (Garten) would be like, "How easy is that?" But then... "Uh oh, babe (my husband is helping at this point), it's sliding." "nooooooooooooooo!!!!! quick, get a plate or something. we'll slide it onto that. we can save this... oh no, that's not working. oh, no. oh, no! wait, let's at least get a picture." That is hilarious. I know that feeling when the icing starts to collapse all the hard work you've done. Sadly the internet can't express how damn GOOD this blob tasted! Ours was a disaster as well. 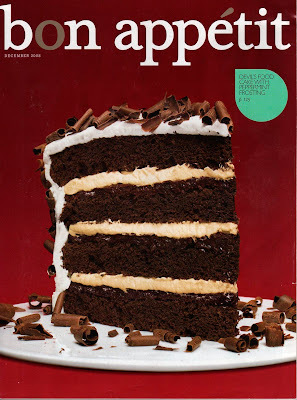 Day after Thanksgiving, hours of prep, beating, stacking, stilting to reinforce sliding layers... Today we are attempting the equally lovely, tho not nearly so tall, BA April '09 "Coffee-Chocolate Layer Cake with Mocha Mascarpone Frosting". All we have left to do is the 2nd, and final, layer of frosting. How easy is that? 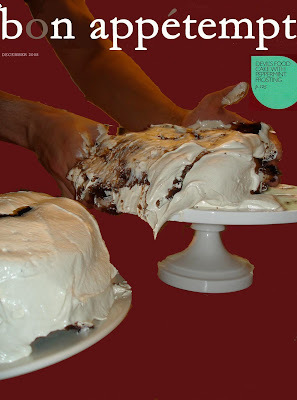 I made this Thanksgiving 08 and I thought that the sliding was because the ganache was still too warm! I'm attempting it again today, and planning on letting the ganache sit for a while to get cool. I may also run out and pick up some of those post things they use on ace of cakes to stabalize it! I love this! Precious. I had many of those moments in my life... continue to have in fact. I know I'm late to comment but I was looking for this recipe since I tore it up last year. I made this recipe 2 years in a row. We call it cake in a bowl cuz that's what was the closest thing that I threw it in when it all went wrong. The first year the layers split and it all started to slide. The second year the layers didn't split but the cake did slide. I was never going to attempt this horrid recipe again but found out I can't come to Thanksgiving without is. Even though it ends up in a bowl it is the hit dessert of Thanksgiving. So, I'll be making cake in a bowl again. If it does work out and turn out as it's supposed to I'm sure my family will be very disappointed. Your version of the magazine cover is awesome. Your photo made me laugh, for which I am grateful, because I've just had the experience of making this cake and having pretty much the same thing happen. And when my recipes don't turn out, I get soooo steamed and very grumpy. So thanks for the photo and the laugh. Holy shite - I was laughing SO HARD while reading this because it is the EXACT same thing that happened to me!!! I ended up dumping everything into a footed glass dish and calling it a trifle. No one was fooled and no one ate it because it looked terrible...but it tasted good!